Preheat oven to 425'. 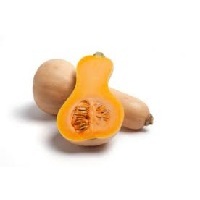 Toss butternut with 1 TB olive oil and spread in a single layer on baking sheet. Roast until squash is tender and slightly brown, about 40 minutes. Place the spinach in a large bowl and set aside. In a small skillet, heat olive oil until just warm. Stir in garlic, remove from heat and set aside. Cook pasta according to package directions. Drain and immediately pour the hot pasta on top of the spinach. Let sit for a few minutes to slightly wilt the spinach. Add the butternut, blue cheese and garlic olive oil. Toss until well combined and serve warm.